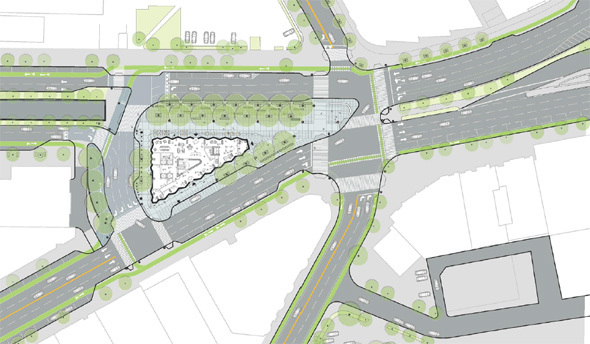 Developer Robert Korff has filed detailed plans for a 27-story hotel in Kenmore Square that would feature a new plaza in the middle of what is now one of the city's busiest intersections - with his hotel and a half-acre of public outdoor space in the middle. Read more. Dunkin' Donuts fills 3/4-mile gap on Comm. Ave.
BU Dining Services reports the opening of a Dunkin' Donuts on Buick Street, off Commonwealth Avenue, midway between the Dunkin' Donuts at the George Sherman Union and the Dunkin' Donuts at 1020 Commonwealth Ave.
"So Boston it hurts," Jonathan Levitt says of the scene on Comm. Ave. in Allston yesterday. 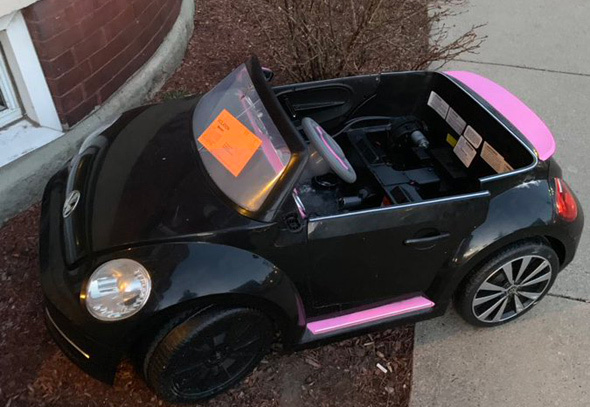 But come on - the car is partly on the sidewalk. Read more. 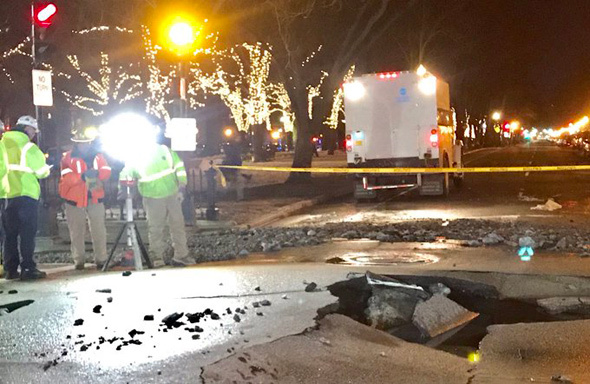 Rick Macomber shows us the aftermath of the water-main break at Commonwealth Avenue and Exeter Street last night. You might want to avoid the area around a broken water main there. BPD officers are there to help guide you somewhere else as BWSC workers struggle to contain the might flow, which has now inundated Exeter between Newbury and Marlborough and forced the evacuation of some buildings. 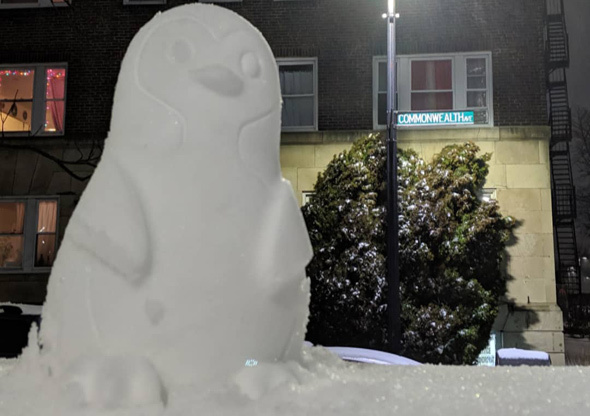 Margo Romanowski couldn't help but spot this giant snow penguin on Comm. Ave. in Brighton tonight. The Daily Free Press reports the 7-Eleven on Commonwealth Avenue at Harvard Avenue was held up by a masked man with a gun around 2:20 a.m. on Tuesday. UPDATE: After 11 hours, the B Line started running again. A B Line trolley went off the rails as it trudged along just past Kenmore Square. WBZ reports there were no passengers on board at the time, and no injuries. The Zoning Board of Appeals last week approved a smoothie shop proposed for Commonwealth Avenue, across the main entrance to the Boston College campus. Read more. Citizen complaint of the day: What lies beneath? Is this legal? 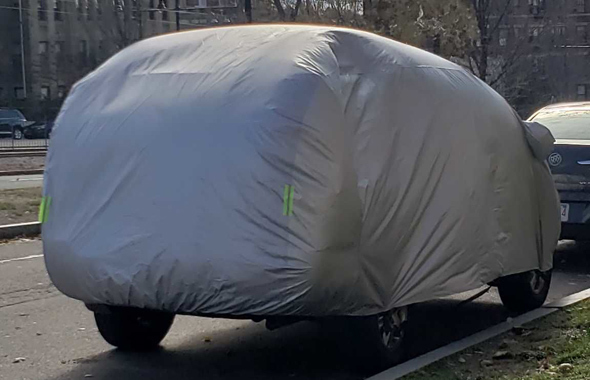 What is hiding underneath? 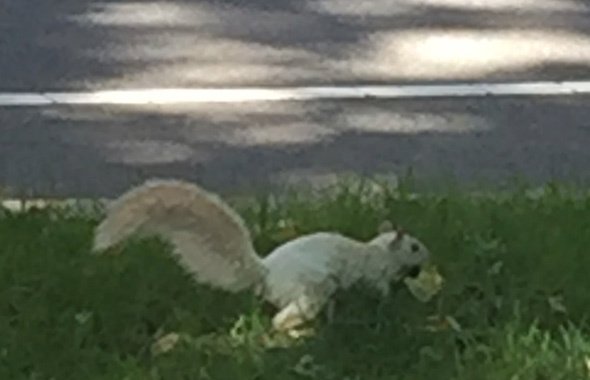 Maureen O'Hara reports that Steve the Blond Squirrel seems to have said nuts to the Public Garden and moved on down to the Commonwealth Avenue Mall between Berkeley and Clarendon. Steve in the Public Garden. 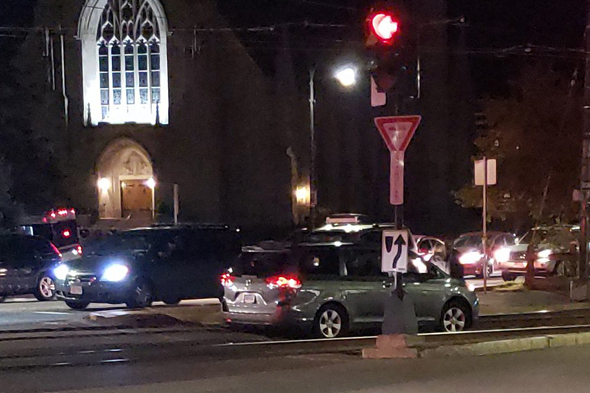 The MBTA is reporting 15-minute delays on the Green Line to and from BC due to the car on the tracks that Fuad photographed. 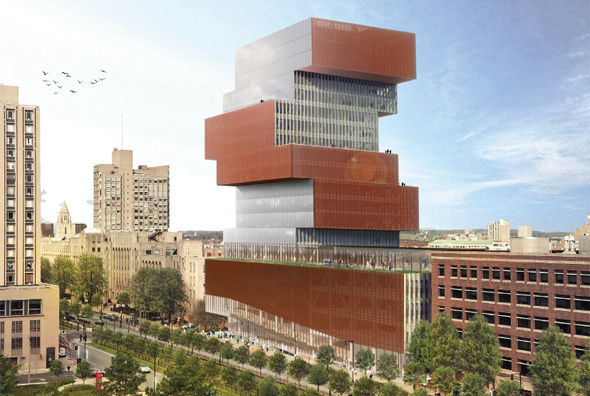 A developer's plans to rebuild the dowdy Algonquin Club at 217 Commonwealth Ave. as a place for rich millennials to unwind hit a snag recently when the Back Bay Architectural Commission ruled a proposed glass-enclosed roof deck just would not do. Read more. At least they left the slats behind? 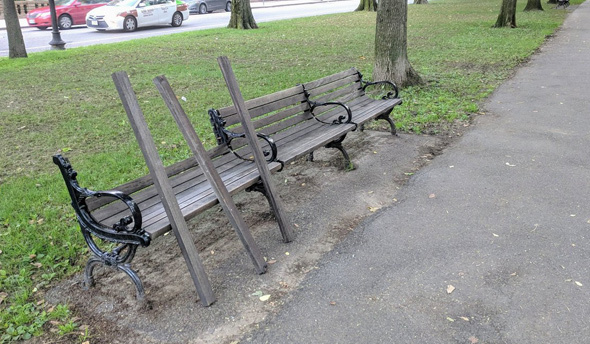 Damaskin surveyed the damage to one bench on the Commonwealth Avenue Mall this morning. Tree takes out two cars on Comm Ave.
Fuad shows us the aftermath of a tree falling on two cars on Commonwealth Avenue between Griggs and Allston streets, first last night just after it happened and then this morning after the remains of the tree had been hauled away. 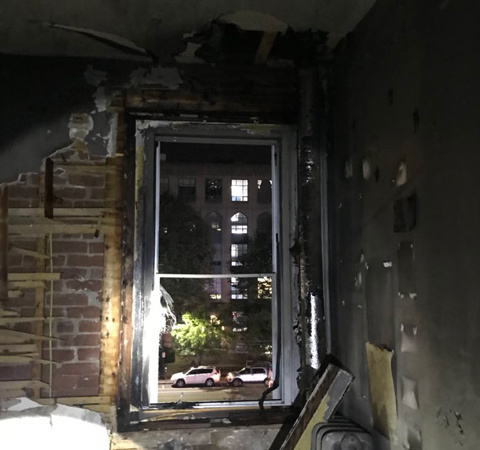 Boston Police report a woman walking in the area of Commonwealth Avenue and Linden Street between 2:45 and 3:15 a.m. today was forced into an alley by two men - one armed with a knife - and sexually attacked. Read more. MassDOT reports replacement of the decrepit parts of the outbound side of the Commonwealth Avenue bridge over the turnpike and Worcester Line is going well enough that it expects Green Line service to be able to resume this afternoon - and the bridge and the neighboring BU Bridge should be fully open to drivers, pedestrians and bicyclists tomorrow.